TICKETS for the MAGIC OF BRONZE CONCERT, “Ringing Movie Magic”, are now on sale. This amazing group of bell ringers from all over central Florida will play the themes from many of the great motion pictures. If you heard them last Christmas let your friends know what an opportunity it is to have them back again. The proceeds from the show will support the music education work of Magic of Bronze and our own Infant and Toddler Pantry. Tickets will also be sold at the door (if seats are available). 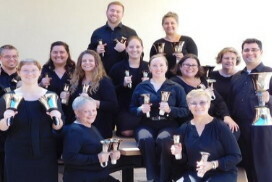 Magic of Bronze is an auditioned community handbell ensemble based in Central Florida. Since its founding in 1996, Magic of Bronze has worked to attract and challenge intermediate to advanced handbell ringers, be a resource for the Central Florida handbell community, expand public appreciation of and interest in handbell music, and provide handbell education within the community. Magic of Bronze is a 501(c)(3) non-profit organization.